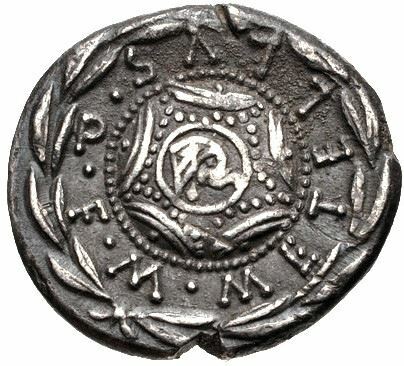 M. Caecilius Metellus was one of the moneyers for the year 127 BC. According to Crawford, he is presumably identical to the M. Caecilius Metellus who was Consul in 115 BC. From 114 BC to 111 BC he was Proconsul of Corsica and Sardinia. He was sent to Sardinia to suppress an insurrection on the island, which he succeeded in doing and obtained a Triumph in consequence in Quintilis (July) 113 BC. The same day, his brother Gaius Caecilius Metellus Caprarius also received a triumph for his victories in Thrace. Like other Roman families in the later times of the Republic, the Caecilii traced their origin to a mythical personage, Caeculus, the founder of Praeneste. He was said to be the son of Vulcan, and engendered by a spark; a similar story was told of Servius Tullius. He was exposed as an infant, but preserved by his divine father, and raised by maidens. He grew up amongst the shepherds, and became a highwayman. Coming of age, he called upon the people of the countryside to build a new town, convincing them with the aid of a miracle.